Figure 5: Probing the tip of an AgNW. (a) Scatter plot of measured positions and intensities near the end of the AgNW. The colour of each data point corresponds to . The dashed region indicates the location of the AgNW. (b) Reconstructed image using a Gaussian-weighted average. The image intensity is normalized by its maximum. (c) FDTD simulation of the AgNW mode profile showing an enhancement at the tip (also normalized by its maximum). (d) Image of the measured QD lifetime as a function of position. The colour scale is labelled with both lifetime and Purcell factor. COLLEGE PARK, Md. -- Finding ways to see, position, measure, and accurately manipulate nanoscale objects is an ongoing challenge for researchers developing the next generation of ultra-compact electronics, sensors and optical devices. Even the most advanced conventional microscopes are limited by diffraction of the shortest wavelength of visible light, about 400 nanometers, rendering them unable to produce images or measurements of objects that are significantly smaller than this threshold. Researchers attempt to solve this problem by using "reporting probes." A near-field scanning optical microscope (NSOM), for example, is equipped with a probe attached to a fine mechanical tip that can scan a nanoscale object and create an image based on the electromagnetic field it generates. But NSOMs are complex, delicate and expensive pieces of equipment, and the presence of the tip disturbs the interaction between the probe and the sample, distorting the image. A new study by University of Maryland (UMD) researchers, published in the Feb. 5, 2013 issue of the journal Nature Communications, describes a novel technique for imaging far below the diffraction limit by using a particle that is much smaller than the wavelength of light as an optical probe. The particle is manipulated with high precision using an inexpensive microfluidic device. The breakthrough has enabled the researchers to capture nanoscale measurements with a spatial accuracy of 12 nanometers. A quantum dot is a 3–6 nanometer-sized, semiconducting particle about 25 times the diameter of a single atom. At room temperature, quantum dots can emit single photons of light that can be tuned to a desired wavelength. This makes them ideal probes for examining nanostructures smaller than the visible light threshold. Positioned close to a nanoscale object, the quantum dot becomes a sort of spotlight that amplifies what the microscope alone cannot see. The problem? It is hard to capture and scan a single quantum dot over another nanoscale object. The UMD team’s solution lies in a microfluidic device that manipulates and positions quantum dots using precision flow control. A computer algorithm analyzes the dots dispersed inside, selecting one to be the reporting probe. As the microfluidic device creates a fluid flow, the targeted dot begins to move. An image-guided feedback process continually tracks the dot’s location and adjusts the flow accordingly. For example, if the dot is observed to be to the northwest of its desired location, a southeast flow is created to move it into place. This technique gives researchers the ability to manipulate a single dot precisely, guiding it quickly to desired locations, and holding it in each position with nanometer accuracy so it can be used to scan objects. The dot’s response to each scanned object is measured, providing information about the object’s electromagnetic fields with nanoscale resolution. Since nothing mechanical touches the quantum dot or affects its interaction with the objects it scans, the images produced are distortion-free, clean and sharp. In addition to its technical superiority, the new nanoscale manipulation system is far less expensive than near-field scanning optical microscopy, which requires equipment that costs hundreds of thousands of dollars. 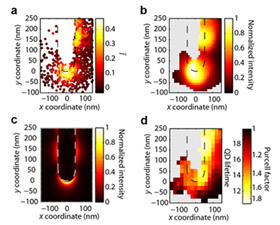 “The new technique is more versatile, easier to implement, and more accurate by an order of magnitude than conventional near-field scanning optical microscopy,” says Shapiro’s colleague, Prof. Edo Waks (Department of Electrical and Computer Engineering and Institute for Research in Electronics and Applied Physics). “Basically, we can take a microscope, add a disposable microfluidic device, and beat the capabilities of an NSOM at a fraction of the cost and complexity. “An undergraduate could build the basic two-channel microfluidic device used in the process, using standard soft-fabrication techniques, in less than an hour for under $50,” he adds. The UMD team is hoping to package all of the necessary system components into an inexpensive add-on product for microscopes. Support for this research has been provided by the Defense Advanced Research Projects Agency (DARPA) and the Office of Naval Research (ONR). The project evolved from early research supported by Shapiro’s 2004 National Science Foundation grant. In addition to Shapiro and Waks, research team members and co-authors include: Prof. John Fourkas (Department of Chemistry and Biochemistry and Institute for Physical Science and Technology), Ph.D. students Chad Ropp (Electrical and Computer Engineering) and Zachary Cummins (Bioengineering), and alumnus Sanghee Nah (Ph.D., 2012, Chemistry). “Nanoscale imaging and spontaneous emission control with a single nano-positioned quantum dot,” Nature Communications, DOI 10.1038/ncomms2477, published online February 5, 2013.